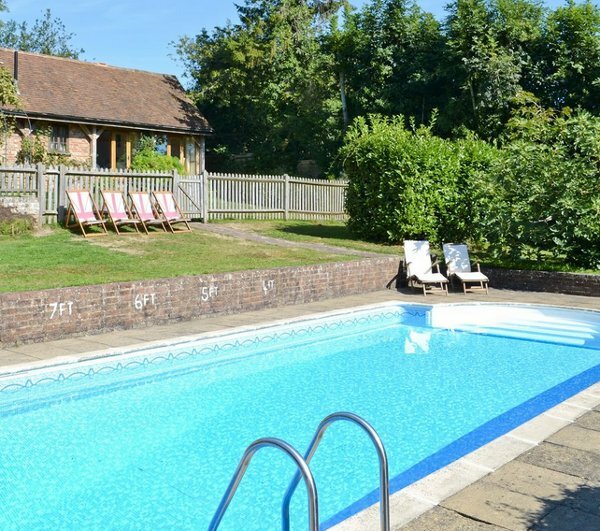 The Mews House is a holiday cottage sleeping 16 people in the village of Burwash, near Royal Tunbridge Wells. With its own hot tub, and an outdoor swimming pool during the summer months, The Mews House makes a good place for a holiday with friends and family. The Mews House sleeps 16 people in 6 bedrooms. The bedrooms are made up of 4 double bedrooms, with one of the bedrooms having an extra sofa-bed. There are also 2 twin bedrooms, with each bedroom having an extra single bed. The Mews House has a wood burning stove in the living room; with central heating too. You have a TV, DVD player, Wi-Fi, washing machine, dish washer, microwave, range cooker and a fridge/freezer. Outside there is that swimming pool for the summer months; and a hot tub. The garden is enclosed with a seating area and a children's playground. With plenty of parking available at The Mews House. Holiday at The Mews House start on a Friday - with short breaks available too. The shop, restaurant and pub are all ½ mile from The Mews House. or head into Royal Tunbridge Wells for a larger selection. Bewl is the place to head for some water based activities; with plenty of walking and cycling in the area around The Mews House. You have a good choice of National Trust properties to enjoy during your holiday, with Bodiam Castle ("Archetypal 14th century moated castle with ruined interior - a glimpse of medieval splendour") and Scotney Castle ("Country house, romantic garden, 14th century moated castle - all in a beautiful wooded estate") being a couple of example. Hastings, Winchelsea and Rye are all an easy drive. If you're planning a summer holiday at The Mews House, you can spend some time on the beach - and in the sea. Or for a holiday when things cool down a bit, you can enjoy those bracing coastal walks. Should The Mews House not be to your liking, but you fancy staying in the area around Royal Tunbridge Wells, you might well be interested in the cottages below. All these cottages are within a few miles of The Mews House.